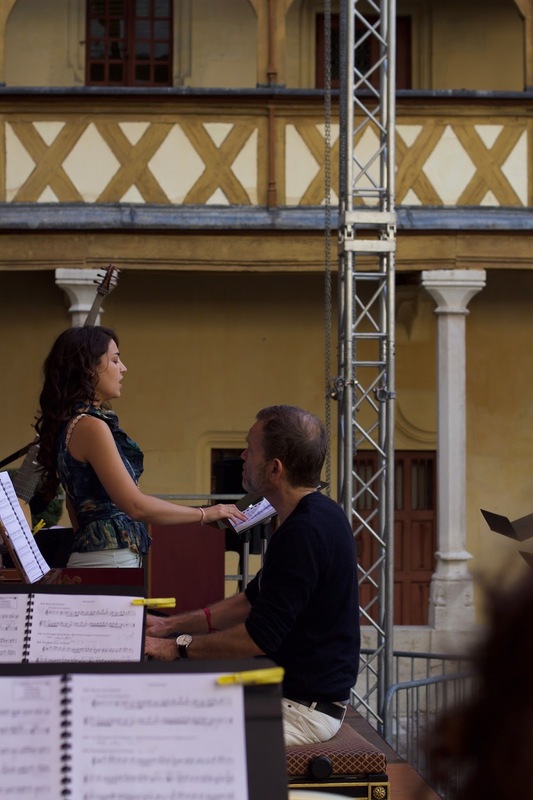 Following on from a residency at the Opera National du Lorrain in Nancy (2014), and a tour to Versailles and Vienna (2016), I joined Les Talens Lyriques for a third time; performing and recording Jean-Baptiste Lully's 'Alceste, ou Le triomphe d’Alcide' (1674) under the direction of Christophe Rousset. Lully's opera 'Alceste, ou Le triomphe d’Alcide' is a 'tragedy in music', with a French libretto by Philippe Quinault based on 'Alcestis' by the classical Athenian tragedian Euripides. Lully's opera premiered on the 19th of January 1674 at the Théâtre du Palais-Royal on Rue Saint-Honoré in Paris. I travelled from London to Paris on the Eurostar on Wednesday 12th of July in readiness to join the rehearsal on the morning of Thursday 13th of July 2017. The morning session focused on the trumpet movements in ‘Alceste’ of which there are nine. Though I was walking into the orchestra's final rehearsal, and I admit that I was expecting it to sound very good, I was astonished by the total mastery that Les Talens Lyriques has of this musical style. More on that later*. We rehearsed in Salle Gaveau on Rue La Boétie in the 8th arrondissement of Paris. This 1020 seat concert hall was designed by the French architect Jacques Hermant for the piano manufacturer Joseph Gabriel Gaveau. The building originally housed the headquarters of the piano manufacturing business, with their workshops located on the Eastern outskirts of Paris in Fontenay-sous-Bois. Rehearsing in this central location meant that I could easily explore Paris in the generous 90-minute lunch break. US President Donald Trump was in Paris today to meet the French President Emmanuel Macron and to attend the Bastille Day parade and celebrations (tomorrow). Security was high and I noticed a presidential theme in this part of Paris. From Salle Gaveau, I walked along Boulevard Haussmann to see the Arc de Triomphe, I continued down Avenue Marceau and Avenue du Président Wilson to see the Flamme de la Liberté - where there was also a good view of the Eiffel Tower. From there I continued up the opulent Avenue Montaigne, continuing diagonally past the Métro stop Franklin D. Roosevelt and along Avenue Matignon to return to Salle Gaveau. I had fond memories of exploring Paris in 2005 with St. Ninian’s High School’s History Department. We travelled from to Isle of Man to Paris to visit many of these landmarks, as part of our studies for the French History part of our A-Level History course. The afternoon call was the first recording session. It began with the Prologue of ‘Alceste’ and continued on through the five acts. I played several times within the Prologue. The opera was originally performed to celebrate King Louis XIV’s victory against Franche-Comté. In the opera, Nymphs await his return from battle during the Prologue and the music symbolically includes a ‘Prelude de trompette’ in movement 0-3: ‘Bruit de Guerre’ (Noise of War), shortly followed by the triumphant 0-5: Rondeau pour la Gloire (Rondeau for the Glory) - which is an exceptionally memorable tune. The trumpet returns partway through 0-12 ‘La Gloire, les Nymphes, chœur: Que tout retentisse’ (Let everything sound) which segues into 0-13 Air pour les divinités des fleuves et les nymphes (Air for the divinities of the rivers and the nymphs). The trumpet does not play at all in Act I (while Alceste is abducted by Licomède), instead returning in the more military-themed Act II Movement 2-3: Marche en rondeau, 2-5 Marchez, marchez, marchez, 2-6 Entrée, and 2-7 Achevons d’emporter la Place, before the return of the same music from 2-3 at the end of the act (2-13). At that point, we reach the interval and there ends the trumpet-involvement in the opera. Finishing the rehearsal earlier than most meant that I had time to explore Paris again before our scheduled 18:53 train. 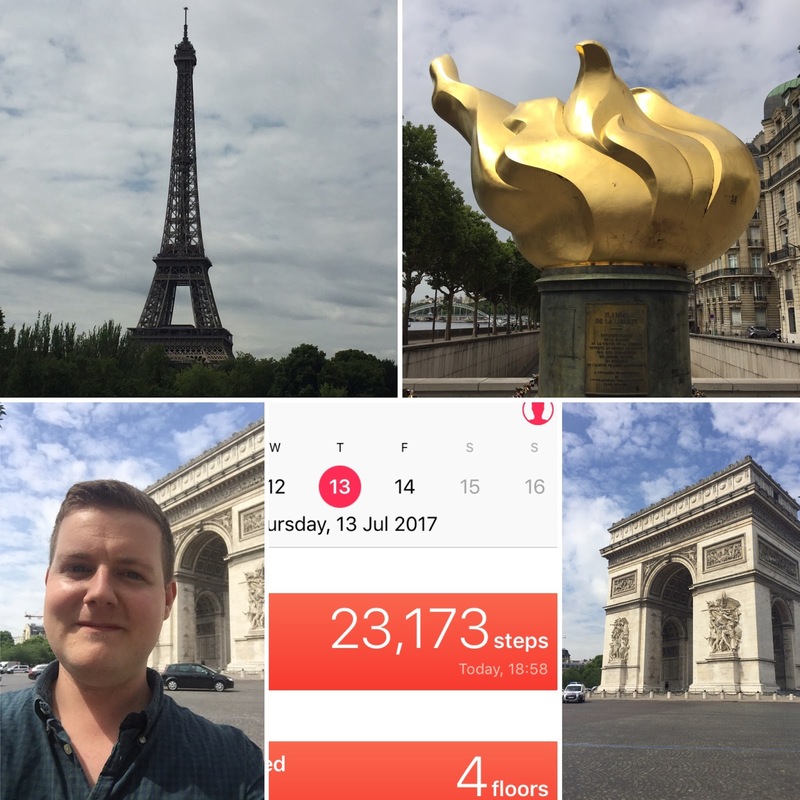 I decided to walk the 6km from Salle Gaveau to Gare de Lyon to see some interesting landmarks as I went. I wandered along Rue du Faubourg Saint-Honoré, the most direct route, and passed the Élysée Palace where the US President and French President were meeting. I negotiated my way through the blockaded streets where there were sniper riflers, military guards and armed police. It was amazing to think that this was happening just a few streets away from where we were rehearing and recording. Rue du Faubourg Saint-Honoré becomes rue Saint-Honoré and I later realised that I had walked alongside the Palais-Royal - its theatre being exactly where Lully's 'Alceste' was originally performed. I continued down Rue de Rivoli, passing the Musée du Louvre, Notre Dame, Tour Saint-Jacques, the Hôtel de Ville and continuing on to the Place de la Bastille. All this walking reduced the amount of time I would have to wait at Gare de Lyon, and I met the non-Parisian members of the choir and orchestra ready for the 18:53 train to Beaune. 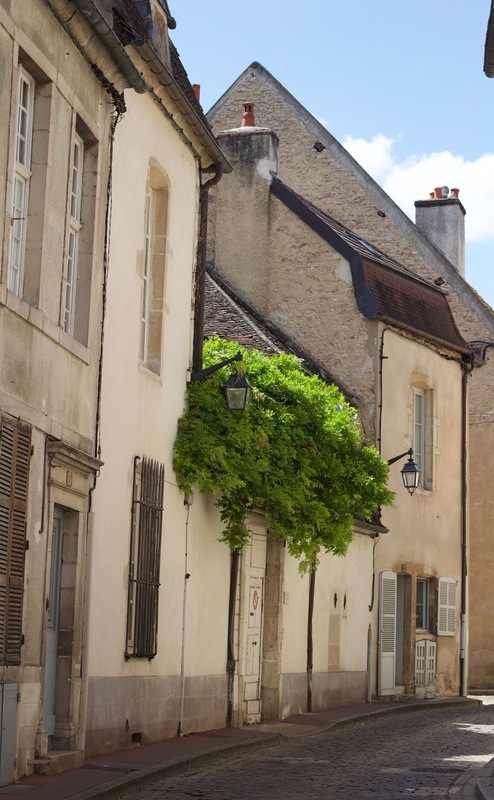 We arrived at Hôtel Henry II with enough time to visit the historic centre of Beaune and briefly enjoy a glass of local wine before retiring for an early night. 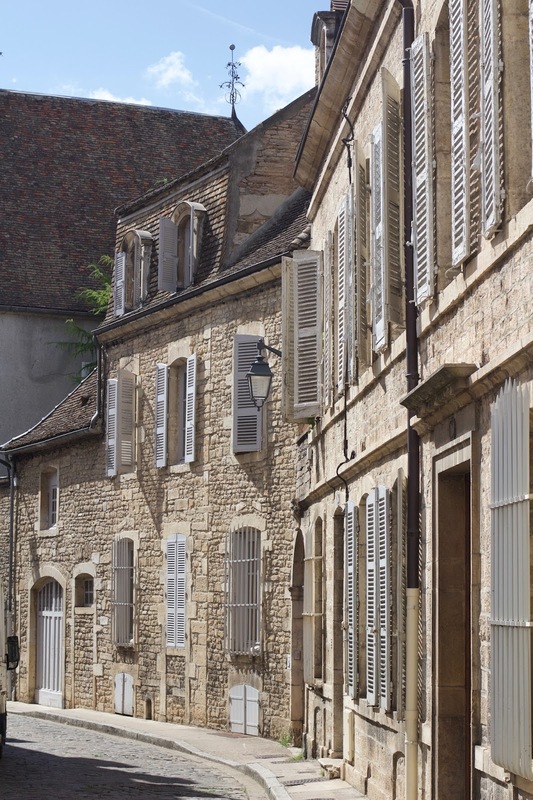 I have visited Beaune once before (to perform with the Gabrieli Consort; back in 2013 when I wrote noticeably shorter blogs). It is an ancient and beautiful fortified town with remnants of a moat, watchtower, battlements and ramparts. 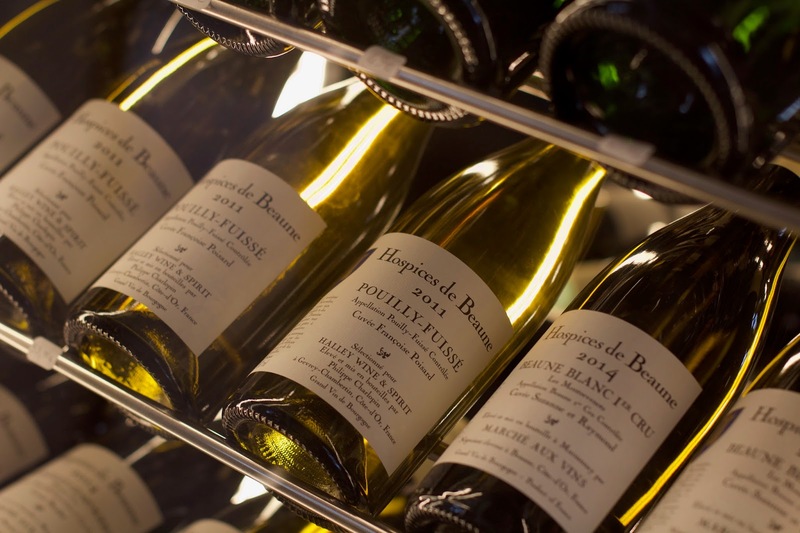 Beaune is the wine capital of Burgundy; the charitable auction which has been held annually at the Hospices de Beaune since 1859 as part of the three day festival Les Trois Glorieuses is apparently the most important wine auction in France. 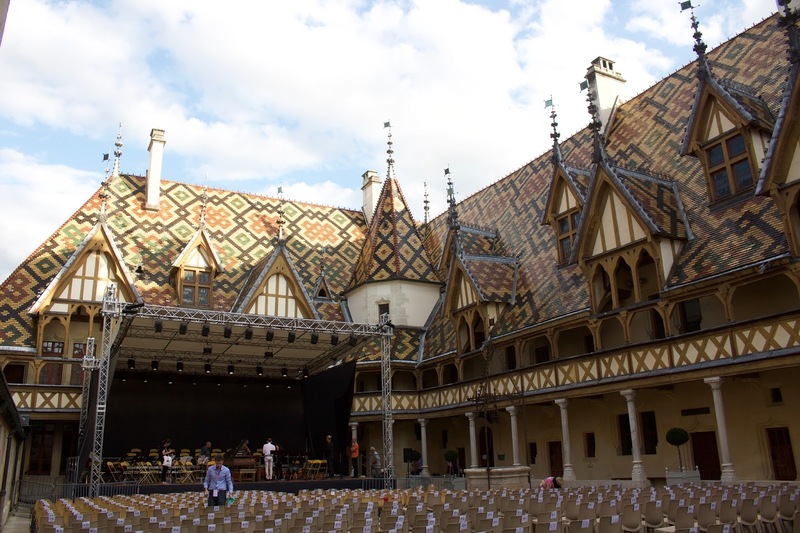 It was exactly there, surrounded by the 15th-century buildings of the Hospices de Beaune, that Les Talens Lyriques would be performing Lully’s ‘Alceste’ as part of the Festival de Beaune (Beaune has an acclaimed International Festival of Baroque and Romantic Opera). A stage had been built in the courtyard and chairs were laid out in preparation for our 21:00 concert. We had a free schedule in the morning and mid-afternoon while the Parisian members of the orchestra travelled to Beaune. 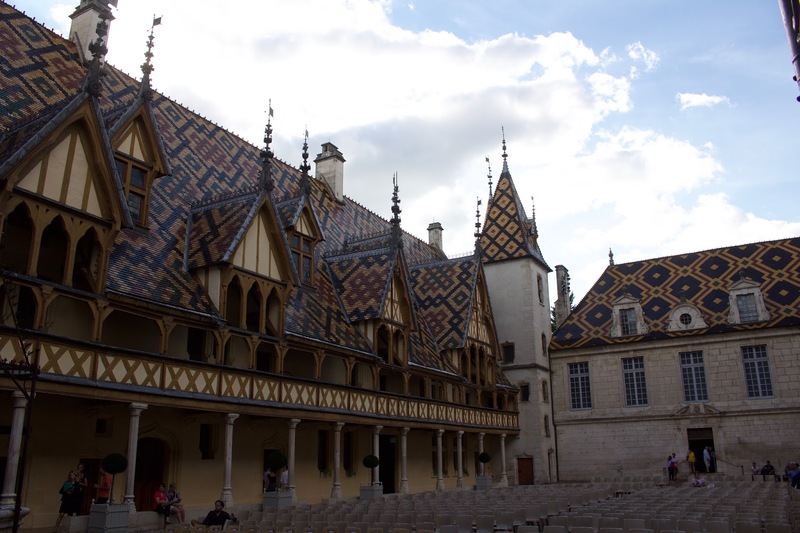 I enjoyed exploring the town, though the wine-based attractions of Beaune were off-limits before the concert and it seemed overkill to visit the Hospices de Beaune when I would be there all evening anyway. I kept myself occupied by looking around the shops, wandering around the historic centre, enjoying a long lunch and taking photographs of the picturesque streets. The performance venue was stunning. Members of the choir and orchestra took souvenir photographs of the beautiful scene at the beginning of the rehearsal. It was a photogenic evening in the brilliant sunshine. Swallows on the wing and the patterned roof tiles of the early Renaissance Hospices certainly added to the ambience of the courtyard. The outdoor concert began at the cooler hour of 21:00. Although we used clothespegs to secure the sheet music there was not much wind at that time. In fact, I would go so far as to say that conditions were perfect for an outdoor concert - something that could definitely not be relied upon if this were to happen in Britain! The long, rectangular courtyard also had an excellent acoustic. Performing the opera was very exciting. I was on high alert as I had only played through the opera once in order. 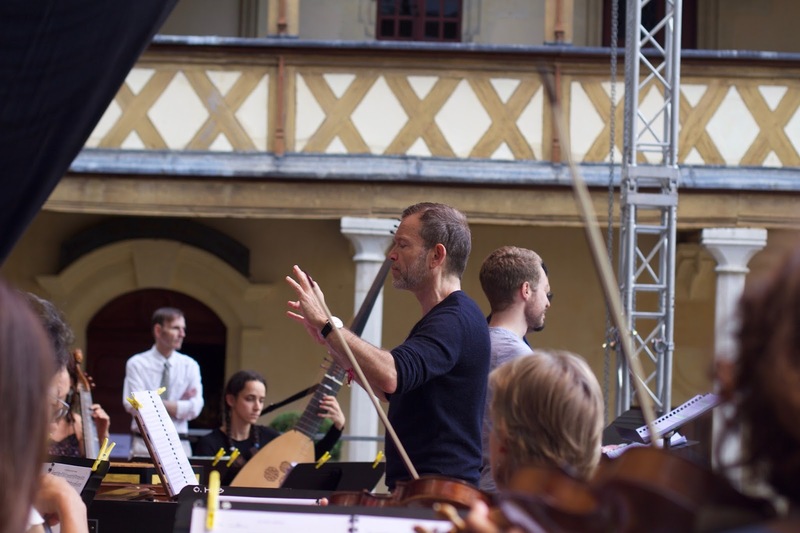 There were a few quite intricate entries I had to negotiate but I felt reassured and secure playing under the brilliant and clear direction of Christophe Rousset. The Prologue and each subsequent act flowed seamlessly and it was a great pleasure to perform with (and listen to) Les Talens Lyriques. The choir, the Chœur de chambre de Namur, were utterly brilliant. They exercised great diction and were exciting, balanced, controlled and refined. The soloists were equally excellent and the opera's plot allows the listener plenty of opportunity to hear from each of them in turn. The continuo section did a fantastic job accompanying the soloists throughout complex recitatives and in the other movements as well. The opera is rhythmically diverse, including some complex time signature changes - which the whole group navigated with unbelievable ease. *It was an education for me to hear the way the ensemble approached this French baroque music. The string section of the orchestra, led by Gilone Gaubert-Jacques, particularly impressed me with the way that they all effortlessly executed exactly the same ornaments simultaneously. The ensemble’s sense of inégales was completely second-nature and the accelerating trills were controlled and stylish. I never fail to be amazed by how simple French baroque music can look on the page compared to how it sounds in reality. The modest ‘+’ above a selection of notes and the application of an understood (usually unwritten) set of conventions has a transformative power over the music. Again, I'll talk more about French baroque music later*. During the interval I felt relief at the thought of being finished but I also found myself wishing that I was involved the second half. I was really enjoying it. I got changed and sat at the back of the courtyard and listened to the remainder of the opera, beneath the twilight sky. Waking early, there was chance for breakfast before taking the train. We had to get back to Paris to get on with the recording. 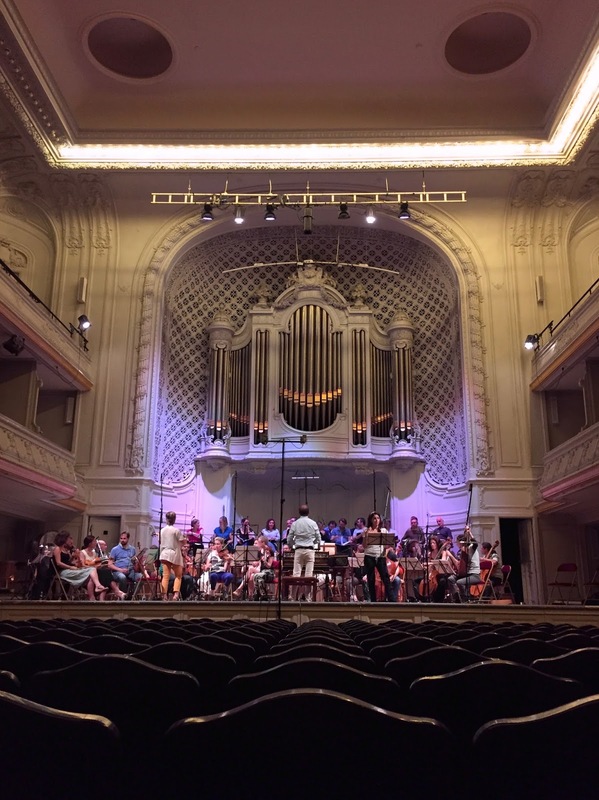 The microphones had been left in place at Salle Gaveau, and levels were set from Thursday's session. After arriving at Gare de Lyon, we took the Métro (no time to walk on this occasion) to Miromesnil, directly outside Salle Gaveau. There was just enough time to find and eat a sandwich before the recording session began. We recorded all of the choruses in the opera, from the Prelude right through to Act V. It was clear that we were working with an excellent and experienced recording team, who were from the label Aparté. I really enjoyed playing and listening to all of the choir numbers. It was also great to hear the different kinds of dance movements played by the orchestra, some including delicate and tasteful percussion from our colleague David Joignaux. I had just two numbers left to record, but I was glad to hear more of this fantastic music while I waited. After the choir had finished, we went back to the beginning of the piece to record 0-3 through to the end of 0-5, the catchy and triumphant Rondeau, which was the last thing we recorded that day and it was the the last recording session for me. It had been such an enjoyable experience. The orchestra would continue recording for one more day, without the choir and trumpet. It was an amazing project and I feel very lucky to be a small part of this incredible orchestra. The project will recommence for a performance in December 2017 at the Opéra Royal de Versailles. It has to be said that Les Talens Lyriques is an incredible organisation. The projects work thanks to the planning and artistic coordination of the brilliant Benoît and his wonderful colleagues Elise and Romain. Behind the scenes there is fantastic work from the librarian and musicologist Bénédicte, also from the financial administrator Anne-Sophie, as well as from the group's cultural and marketing team. 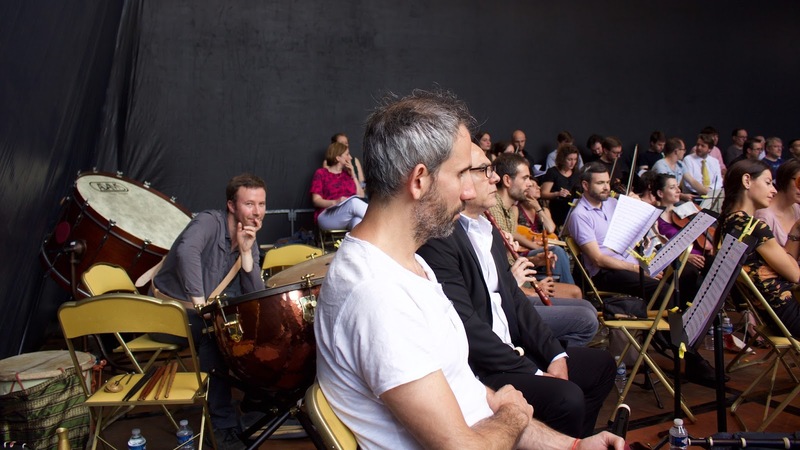 The musical edition we played from was specially made by Nicolas Sceaux for Les Talens Lyriques and Christophe Rousset. Brilliantly, the scores and parts are free to download, distribute, modify and perform under a Creative Commons Attribution - ShareAlike 4.0 license. This was made possible thanks to the support of the Philippine de Rothschild Foundation. After the recording, I checked into Hotel du Pré and spent the remainder of the evening with some of the orchestra and choir members in the restaurant at the end of the street. I woke early the next morning to catch a train. Instead of heading straight home after the project, I had decided to visit my friend and colleague Gareth Hoddinott at his house in Montgilbert, in the Alps to the South of Annecy. I took a train from Gare de Lyon to Annecy, where Gareth met me. 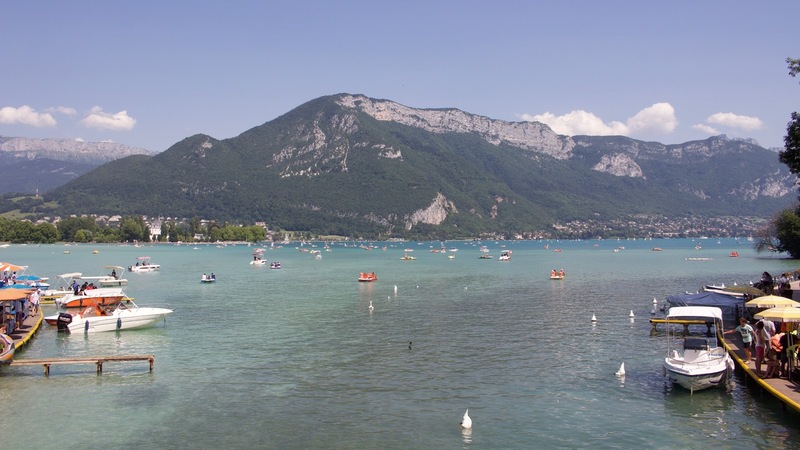 We spent some of the day swimming in Lake Annecy and later we played trumpets and cornetti (and barbecued) at Gareth's house - 2,142 feet (652 metres) above sea level - with spectacular views over the valley. * I have played and studied French baroque music on many occasions but never before have I played French baroque music with a French baroque orchestra. 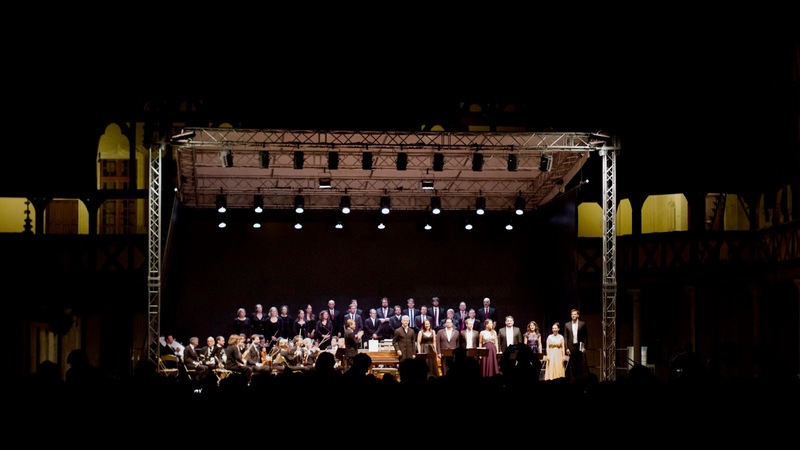 It was a great pleasure for me to do this with Les Talens Lyriques. From a language point of view, there are many differences of syllable emphasis which have to be taken into consideration. Also, several of the phrases I had to play ended with an accelerating trill, before the phrase was repeated. I found that the usual places in which a wind or brass player would normally breathe were often replaced by ornaments. I supposed that there are two options: either to accept that you play a different instrument and that it is okay to sound like an individual colour sometimes; or to personally adapt the phrasing by quickly and subtly taking breaths wherever possible, enabling proper execution of the ornaments where the breath would normally be. I decided that it would be a real shame to take a breath and break up the unity and beauty of a good Dessus section ornament. There were other occasions where I just took enormous breaths and played through both repeats in one breath. Discomfort is temporary, recordings are permanent! However, it has to be said that there are occasions where both approaches sound convincing. It is quite a thrill to be running on empty lungs and for nobody to notice. All this coupled with the fact that I was playing on a trumpet in C at A=392Hz (commonly referred to as French baroque pitch). This pitch means that the trumpet you have in your hands is effectively a trumpet in B-flat at 440Hz, (twice the length of a B-flat trumpet, or the same length as a modern orchestral trombone in first position). I was very pleased with the low B-flat trumpet I was playing, especially as I had a fair amount of input in its design. The other musical decision I had to make (which also appears in music by Biber, Schmeltzer et al.) is what to do with the middle B naturals that occur quite frequently, most commonly as a passing note between two Cs. By my estimation, there are three options here: the first option is to close the hole and bend the note (the danger is that you perhaps risk playing a B-flat); the second option is to open a finger hole entirely (which is not historical); the third option is to ‘ghost’ some of the passing notes, to imply that they are there and treat the surrounding Cs in the same way you would if you had actually played the B - but not to actually play them (or to play them very quietly). As ever, there are different occasions to use combinations of the above to work in a given context. My preferred options are the bending and ghosting ones. As ever, playing without vent holes should inform how to play if we chose play with vent holes. All too often, I hear trumpet players using vent holes to obtain sounds that are only possible because of the vent holes. The experience of playing without holes has to inform the approach of playing more compromised instruments. It was great to be able to experiment and learn in the context of French baroque music, played by a world-class ensemble.